One of the problems with moving from a 2800 sq. ft. house to about 400 sq. ft. motorhome is having space for everything. The problem I had was a place to dry wet swim wear and towels. At most campgrounds you can't have a clothes line on your campsite. Some people have clothes line units on the back of their TT off of the bumpers. We do not have a bumper on the back of our motorhome. So when we stayed at Space Coast RV Park in Rockledge, Florida I saw this great idea for a portable/part time clothes hanger for swim wear & towels, and I just had to make it and have it. This is a very easy little project to complete. 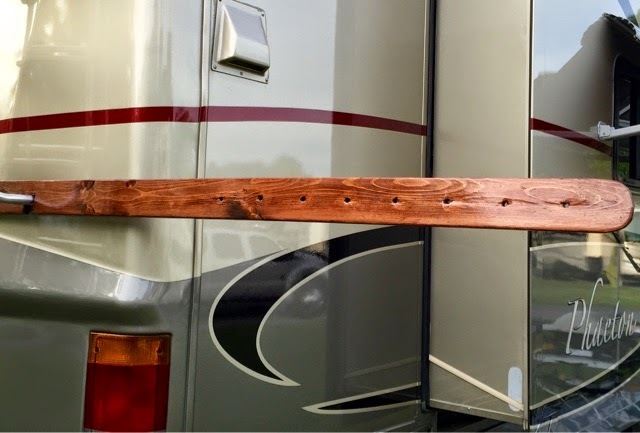 First you need to have a ladder mounted on the back of your RV. 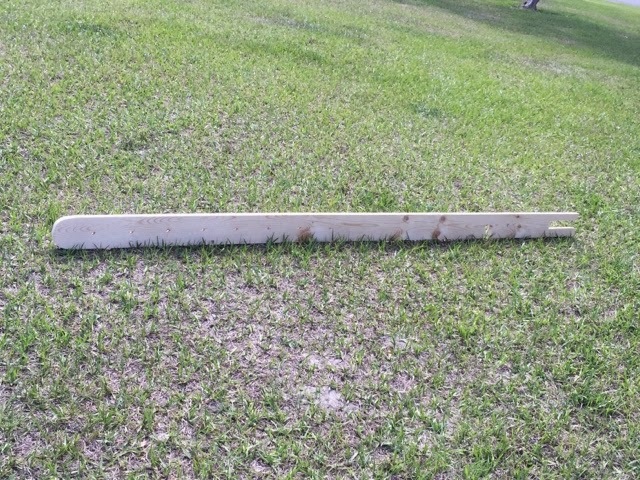 Start with a standardized pine board 3/4" x 4" x8' in size. Measure the distance between the ladder mounted on your MH. At the end of the pine board cut a small slot in the end of the board to fit the size of the ladder. Then mark the size/distance of the ladder mounting on the board and cut the second slot. Will look like this. When the cutting is complete you should be able to slide the board on to the ladder and lock it in place o your MH or TT. Next take the board and drill holes about 6-8inches apart for the size of the cloth hangers. Only make the hole just bigger than the end of the hanger to fix thru the hole. That way the wind will not knock the hanger out of the board. Lastly just sand, stain, and poly the board to protect it from the weather. 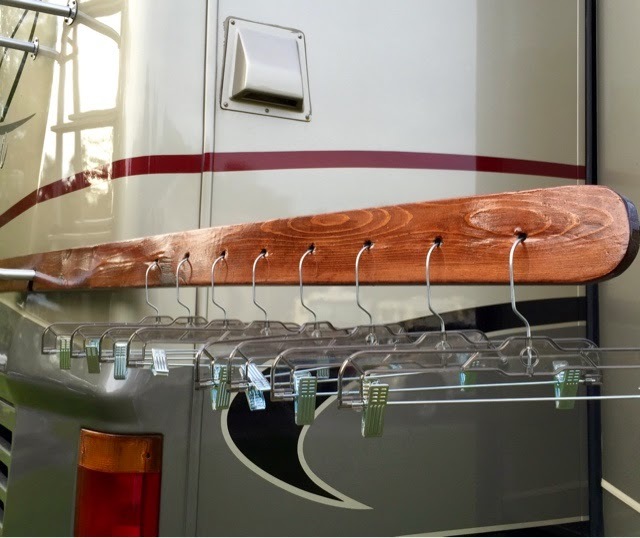 And you have a nice hanger for the back of your RV for under $15 bucks. The cloth hangers are the "skirt" type costing about $1.50 each. When you are set to travel, just remove from the ladder and put it away in storage till you are at your next campsite. Thank you. We have found that it works very well for us. This is a great idea, Bonnie! Having spent my career in woodworking, I have a suggestion for a potential problem hat might crop up. The board may want to split along the grain at the point where the horizontal slot ends, due to the cantilever stresses that are put on it. A brass mending plate, spanning that point and facing outward (so as to not rub against the rig) would carry that stress and take care of that. Mending plates can be found in the hardware section of any home center or hardware store, near the hinges and latches. Your idea sounds very good. I will install one on the board today. I have also installed a piece of foam between the board and the body of the motorhome too.